Provide plenty of water: keep water dispensers filled and ice-cold so guests can easily stay hydrated. If at a seated meal, ask servers rotate through the venue regularly refilling glasses. Be especially sure to refresh the water supply after dessert has been served, when guests are likely to get thirsty again! Choose light appetizers: keep your menu feeling summery and fresh by providing light appetizers (as opposed to heavy comfort foods). Caprese skewers, fruits, and cheeses are always good options to keep the menu feeling seasonal. Provide summery cocktails: Let guests sip on something sweet that tastes like summer. Look for refreshing combinations like cucumber and mint or fruity concoctions that are sweet and citrusy. Include fans: Keep a breeze going with fans if necessary. For an adorable alternative, provide outdoor wedding guests with programs that double as handheld fan. Or use your wedding monogram for a simple but cohesive touch. Plan for sunlight: Have you checked the outdoor lighting at your venue, at the right time of day? Make sure that gorgeous sunset you’re envisioning isn’t actually a bright light causing guests to squint through the whole ceremony. Work your wedding schedule around summer’s long days and bright sunshine. Pack a bridal emergency kit: Have your maid of honor carry a bridal emergency kit for any unexpected uh-ohs. In warm summer months, you’ll be grateful for that travel-sized deodorant or bottle of baby powder. If you don’t use it, no big deal… but you’ll be glad you have it if you find yourself in need! Have a seamless timeline: The best way to ensure success is a well-planned timeline for the whole day. Make sure you capture photos in summertime’s best sunlight, and avoid bright glares. Keep guests moving and entertained, so nobody is lingering and getting antsy in the warm weather. Considering the details beforehand will go a long way in relieving your stress and making the day enjoyable for guests. Best of luck in your wedding planning process! Need help executing all the details? We hope you’ll consider planning your wedding with the best wedding coordinator California has to offer. Carolyn Wilson Weddings & Events is honored to be a part of your special day, whether in summertime or any other season! Vendor management: a schedule helps get vendors to the appropriate locations at the appropriate times. Your wedding planner will be equipped to direct all vendors according to the plan, significantly reducing the chance of any snafus (although rest assured—if an obstacle does come up, your wedding planner will take care of any roadblock so you don’t have to!). Reception flow: traditional weddings pack quite a few events into one evening. 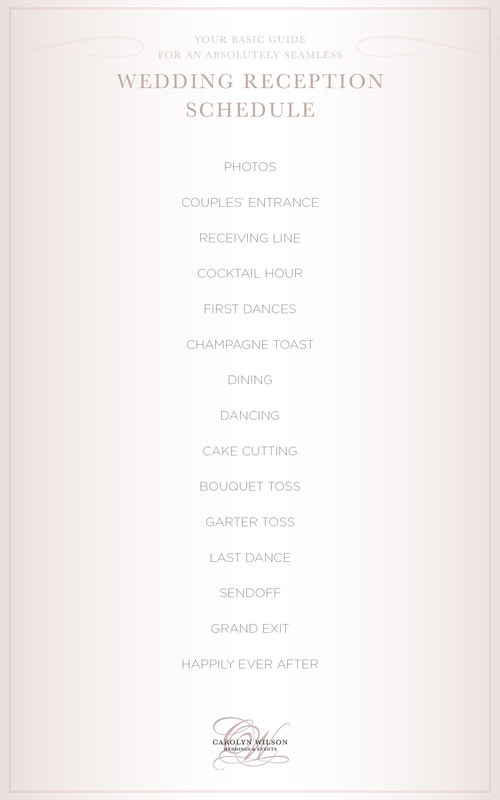 From toasts and bouquet tosses, to dinner and dancing, there are a lot of activities to pull together. A detailed schedule keeps the evening moving along at the perfect pace so you don’t have to rush any events or forgo any traditions you wish to include. An experienced wedding planner will help in this regard as well. If she senses one of the wedding activities is dragging out (oops, that toast went a bit long! ), or another deserves a little extra attention, she can be flexible in facilitating the activities at an appropriate pace. Happy guests: with a detailed schedule, you can rest assured that all guests will have a wonderful time at your wedding. The schedule will prevent mishaps (like transportation arriving late, or the DJ being unprepared when guests are ready to hit the dance floor). It may seem trivial, but scheduling every minute detail will ultimately protect your day from any unwanted obstacles and ensure your guests enjoy the party long into the night. Peace of mind for the bride and groom: this is the most important benefit of designing a detailed wedding schedule! As a bride with a schedule, you can enjoy this precious day without worrying about a single thing. You can live in the moment and trust that your wedding planner has taken care of all the details. Of course, flexibility is equally important as the schedule. Try as we might to plan out all the details, things may not go exactly according to the schedule—and that’s okay! 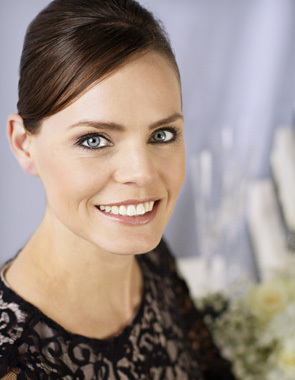 You’re in good hands with an experienced wedding planner who can adapt seamlessly to any schedule. Take a look at our basic schedule guideline here; this provides a basic overview of what you can expect at a traditional wedding reception. Let’s talk about how we can customize it and fill in all the details in a way that fits just right for you. We would love to work with you on your custom wedding schedule! Though planning out the day may seem daunting at first glance, you’ll definitely appreciate all the benefits of a schedule on your special day. We would be honored to plan with you!